NOTE: If you haven't yet completed Challenge #1, click here to complete it. This challenge builds on the first one. Now that you've seen how easy it is to build a skill with VoiceApps, we want to challenge you to create more skills and earn even more prizes. For this challenge, we want you to build 2 more skills for a total of 3 skills. 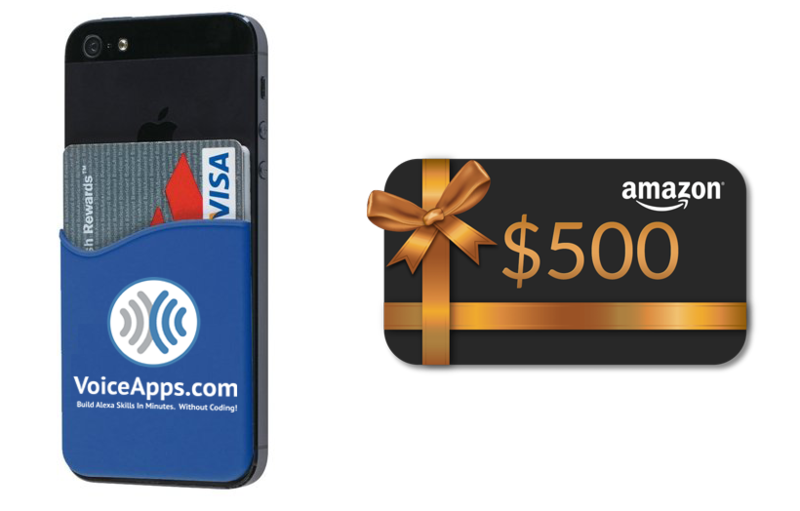 Once you've created and published 2 more skills, we'll send you a Voice Apps Phone Wallet and you'll be entered to win a $500 Amazon Gift Card. All you need to do is create two more skills of different types using the Voice Apps platform and publish them to your Amazon Developer account in the next 72 hours. If you chose a Fact skill in Challenge 1, choose a Joke skill and a Flash Briefing skill, or a Relaxation Sound and Podcast skill this time. To qualify, you need to have created a total of 3 different types of skills. Just like before, you also need to submit your skills to Amazon for certification and get them approved. Now you know why we suggested you create one of these five skill types in the first Challenge! For this challenge, we suggest you pick two different skill types from this list and create those skills. You can create any skill types, but your skills must be different from each other and different from the skill you built in Challenge 1 to qualify. Offer valid for developers who publish an Alexa skill during the promotional period and notify Voice Apps of completion. The promotion period is limited to 72 hours after receipt of the announcement e-mail or notification and, in all cases, ends on September 31, 2018 at 12pm (CT). Offer valid for developers who reside in the US only. Developers who submit to this promotion from outside the US will not be eligible for prizes. Offer limited to one of each promotion benefit per person, per skill ID, developer account, and/or shipping/physical address. Drawing for the Amazon Gift Card will be held on October 1, 2018. Winner will be notified via e-mail. To be eligible for the promotion, you must publish two new skills to the Amazon catalog during the promotion period. Updates to existing skills (published to the catalog before the current promotion period) will not qualify for the promotion for any of the offers.